This looks mouth watering! I’ve been meaning to learn more creole cooking and I came over here thinking I’d look for a jambalaya recipe…but now you might have changed my mind. I came over from your other blog to bookmark this one too! Thanks for all the great recipes! Everyone may have a version of shrimp creole but I can practically smell your version through my laptop screen. Yum! Talk about scratching an itch, I made this tonight and just about died on my couch from the savory flavors and the satisfaction of a well cooked creole. Thanks a bunch! I picked fresh tomatoes, an onion and oregano from my garden for this dish. I made the Creole Seasoning from scratch too. Wonderful recipe! I just made it tonight for a small get together with some friends. Not only is it delicious, but it has such a beautiful presentation as well. This is definately a far cry from my quick and easy shrimp creole with pre-diced onion and pepper with a little bit of tomato sauce. MMMMM…. I don’t have the time tonight, but look forward to trying this soon. 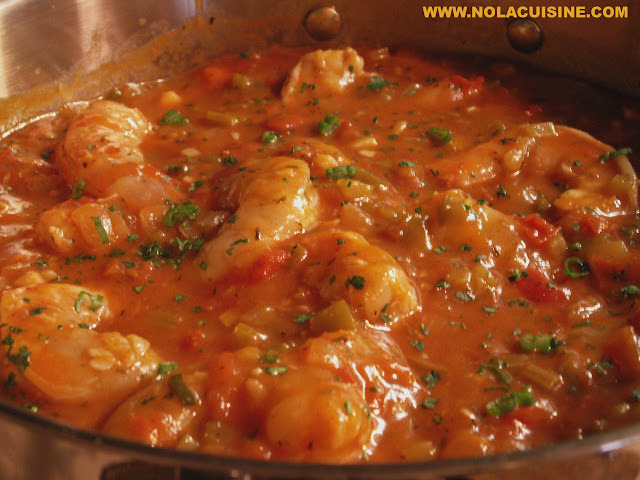 My Aunt, Billie Bourgeois, makes a great shrimp creole. Unfortunately, at 88 years young, she is off touring Russia and won’t be home for a few weeks! I sent the link to my mom in Okla. too. This is an incredible recipe. I am from Cuban and French heritage, and I thought that I could me shrimp creole. This recipe exceeded my very high expectations. And, it is easy to make. Enjoy! This recipe was naturally appealing to us because we like hot and spicy fooods, we couldn’t get over the delicous aroma of the creole seasoning. Dee-licious! My parents are coming to town for Thankgiving, so I made this creole last night, to ensure my forthcoming meal isn’t be a total disaster. While it is time consuming, it’s relatively easy to make. The taste is so much more than a tomato-based ‘blah’. The flavor is actual creole, and not simply southern. Nola, this looks wonderful to prepare for my Christmas Eve Dinner! This serves 4, but I will be serving 12. Do I triple every ingredient? Would like to see response for Bobbie – December 4, 2008. I also will be making for a larger crowd and would like to know how to adjust recipe for 8 or more servings. Today is Sunday, January 4. 2009 and, I just made the Shrimp Creole recipe. I thought for the time, effort & money put into it, it was not worth it. It is tooooooooo salty, much too hot and spicy for most people and the recipe makes too small of a quanity for the time & effort put into it. I had a recipe for Shrimp Creole years ago that I misplaced and it was less time consuming, less salty and, had the same creole taste without all the work. Sorry, I just did not think it was worth it. tomatoes in the shrimp creole recipe? 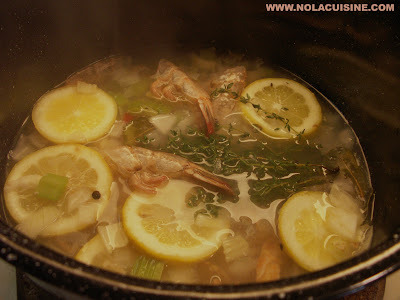 Delicious recipe…however you must must must make the shrimp broth! Otherwise it isn’t memorable. Bon Appetit! I THINK THE RECIPE IS OK…BUT REAL CAJUN CUISINE USES THE FORMATION OF A ROUX…..IT IS THE FIRST THING A CAJUN COOK LEARNS…AND THIS DOESN’T HAVE IT….THE TASTE OF THE BROWNED ROUX IS WHAT GIVES THE DISH ITS REAL AUTHENTIC SMOKEY FLAVOR….ADMITTEDLY…NOT AS HEALTHY: BUT TRY TAKING THE FLOUR AND OIL AND OVER MEDIUM HEAT STIR TIL A ROUX THE COLOR OF RICH PEANUT BUTTER FORMS (DIFFERENT DISHES NEED DIFFERENT DEGREES OF COOKED ROUX)…THEN ADD VEGGIES..ETC. Thanks for all of your comments, I love to read all of them! Debbie – Thanks for your comment as well, you made lovely additions to the dish that I’m sure would be absolutely delicious, but Creole is Creole and Cajun is Cajun, this is a Creole dish. I love Roux in all of it’s different colors and flavors, but Creole cuisine does not always contain a roux. Not to say that it wouldn’t be delicious in the way you described, I would love it. Linda – Is it possible that you used a store bought Creole Seasoning which contain a lot more salt than the homemade recipe which is supposed to be used in this recipe? Sorry to put you out on your time and effort, but I have to say, many people love this recipe. Bobby – Sorry for the late response, I hope you dinner turned out great. My answer if had been on time would be to make a hair above what you were expecting. I would have done 4 times just to be safe. Once again sorry for the very late response. K.Hicks – For God’s Sake, ALWAYS, let me repeat…ALWAYS!! use what comes from your garden first, canned or not, you really can’t go wrong that way as long as it is ripe and ready to use. P.S. Love that you’re growing your own stuff! You are the best! When my girlfriend said she wanted me to make her shrimp creole I knew that I had never tried it before. So after google I found your site and had seen it before. OMGosh!!!! I went to the store to get real shrimp (with peel for stock) It is sooo good. I also had all the ingredients to make the creole seasonings. Thank you Thank you thank you sooo much!!! I have bookmarked your Creole and Cajun recipes!!!! And I tell people about your site as I travel as a field service engineer. Thanks for posting this! I was looking for a shrimp stock recipe for my Enchilado, and came across this. I worked for a family from LA years ago, and was lucky enough to be served this delicious dish. I lost touch with them, and never got the recipe. It sounds exactly what they made, and I can’t wait to try it! Wow- this recipe absolutely ROCKS! Made it tonight and served it with a crunchy baquette and a salad. One of my favorites as well. I appreciate the specification of fresh tomatoes here – I think it makes all the difference in the world; all the acids they add to canned tomatoes make the dish too tangy. I’ve even seen people put ketchup in this! Yuck! Love this one folks, and everything else we’ve tried here. My wife has never had real creole or cajun and she is asking for repeats. Tonight it’s the shrimp creole. My own fresh herbs and the worcestershire I made is aged enough to use. Man does this house smell great right now. I’m wanting to try this recipe down under as I sampled a lot of cajun food in my time in the states, especially New Orleans. I can get all the ingredients here in OZ except for Kosher salt. Is there something I can use as a substitute without ruining this awesome dish? I love your recipes I am making this for my family soon ! The beignet recipe is awesome ! You are my go to guide for Creole cuisine , and I am Creole ! I was just shaking my head over some “creole” recipes on some websites. Thank you for, “keepin it real!” I’ve bookmarked the site and am looking forwards to trying out your version, although Dad’s shrimp creole will probably win out, (gotta stick with good ole Dad). This recipe looks very complicated and elaborate – which means it must be the real deal! My father is a Creole from NOLA and was also a gourmet chef. Whenever he made Shrimp Creole, it took him a while and he never made anything unless he started out with a rue first. I’ve always been disappointed with the taste of the “quick fix” versions of Shrimp Creole. Thanks for posting a recipe that is truly authentic. â€¢ In your recipe for Shrimp Stock I would recommend adding the shrimp heads to the stock which will add another degree of richness-in-flavor. â€¢ A tip to help skim the scum from the simmering stock: Invert a folding metal steamer basket and immerse it into the stock. The holes in the basket allow the scum to rise to the surface and keep the shrimp shells and aromatics from floating to the surface which interferes with the skimming process. â€¢ As a variation of this classic recipe I grill dry-rubbed extra-large shrimp over high heat until charred (about 1 minute per side) then transfer to the pan for the last minute of cooking. The smoky flavor of the grilled shrimp adds another accent to the sauce (especially if you use a pinch of smoked paprika to your rub). If you like the idea of grilled shrimp but wish to keep the sauce classic in taste just add the shrimp atop the rice and sauce when you plate. AWESOME AWESOME AWESOME..THANKS SOOO MUCH!!!! When making this for a larger group, is it safe just to double/triple.quad the receipe. What an incredible recipe! I made it so spicy half of my family could not eat it. More for me 😀 Spicy or not the taste is great! I also threw some of the creole seasoning and a few bay leaves in with the rice while it was cooking. Excellent! Thank you for this recipe! Made this over the weekend to try it out for a family vacation coming up soon. Very, very good!! Definitely a keeper!! Thanks!! Delicious! Thanks for the recipe- my family loved it. It was surprisingly easy to make and didn’t take that long. I even used some of the leftover shrimp stock to boil the rice- gave it a little something extra. I will be making this over and over again! Does anybody know the approximate calories in this bad boy? I’m trying to watch them. Looks good but I found it way too hot and sour. Peppers seemed way out of proportion and they were. Left a sour, flat taste. Blech. The tomatoes acidity wasn’t balanced out. Made this once a few months ago and it was outstanding. Had a craving for it and will be making it again tomorrow. Thanks for the great recipe! Outcome was sensational! Did the shrimp and crawfish combo and it was delicious…shrimp stock gave the dish so much more grip! This will become a staple for our cajun dinner parties. I was so exicted about making this recipe & so disappointed when completed. I should have saved myself some work & just downed some tabasco sauce. I didn’t use half of the stated red pepper or tabasco & it was still mouth fire. No great taste just mouth fire. I followed this recipe to a tee except for not adding red pepper or tabasco. I was very disappointed. Just flew in from a wkwnd in nola and set out to recreate the awesome food we ate. This recipe was really good. In my mind one key is to ensure you carmelize your veggies thereby bringing out the natural sweetness in order to balance the heat. I’ve seen recipes that added some sugar which works as long as it’s imperceptible.thoughts? I tested this tonight…what a great receipe! Thank you so much!For those who said this dish was too hot, the secret is to taste it at every stage and only add as much hotness as you like. This is a keeper! This is the best dish I’ve ever made! I accidentally used three tbs. of creole seasoning instead of two which gave it a nice kick. Everyone loved it. Nola Cuisine is now on my favorites list. 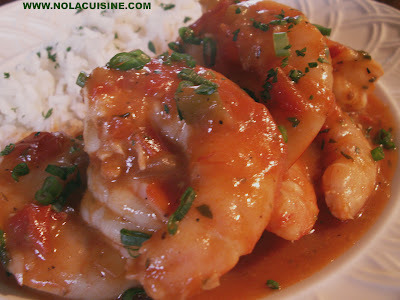 This is by far the best shrimp creole recipe ever and I’ve used it now for years. It bursts with flavor and always impresses! Thanks for sharing!